Please note: The “Use of Circuits” requirement (using 3 station format) is a required criteria for “Advanced Standard”. All applications will be reviewed as they are submitted. Skate Canada is recognized as having the best grassroots program in the country. CanSkate, Canada’s flagship learn-to-skate program, emphasizes teaching quality fundamental movements and basic skills. The CanSkate Excellence Recognition Program is designed to reward Ontario Clubs/Skating schools that are implementing best practices in the delivery of their CanSkate programs. This two-tiered recognition program identifies clubs who meet the minimum standard and highlight’s those who exceed standards. Clubs/Schools who meet the minimum standard will be identified by a ✅ beside their club name to indicate they have achieved the CanSkate programming standards. Clubs/Schools who meet and exceed the standards will be highlighted with a ⭐ on the website. Starred clubs/schools will have priority listing on the website. These clubs will also be listed first in a club/school search. The CanSkate Excellence Resource Chart (updated October 30th, 2018) details the requirements for achieving standard and advanced qualification. How does our Club/School apply? Check the CanSkate Excellence Resource Chart (updated October 30th, 2018) to see if your club/school meets the requirements. Detailed explanations, tutorials and examples are referenced for each standard. Session format/layout – Include the number of stations and the format on the ice for lesson time. Skate Ontario will determine the method of eveluation. CanSkate Specialist visit – A CanSkate Specialist (CSS) will travel to your club to watch a session live. The CSS will evaluate your session based on the same criteria listed in the CanSkate Excellence Resource Chart (updated October 30th, 2018). Submit a video – The video includes an entire CanSkate session (with sound), including all session parts (Warm-up, Lesson time, Group activity, Cool-Down). Payment – There is a $40 fee for application and evaluation. To submit payment, CLICK HERE. 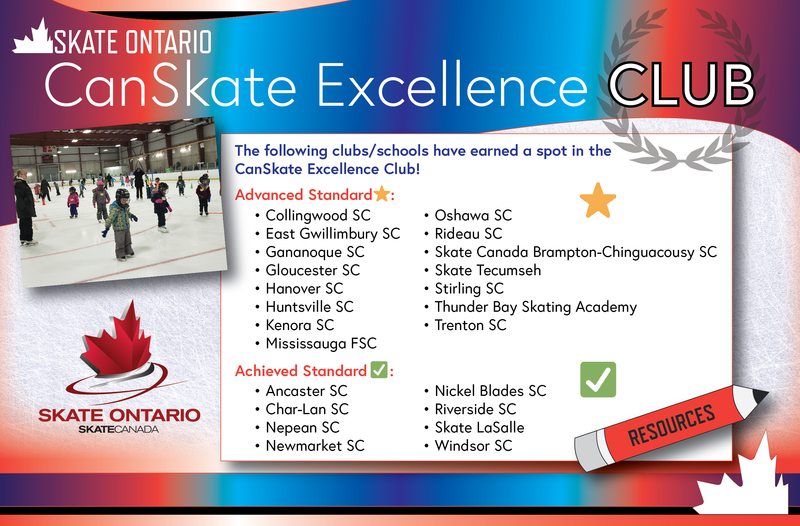 Clubs/Schools who complete the CanSkate Excellence application and review process to achieve standard will be identified by a ✅ beside their club name in the club directory and “find a Club” tool on the Skate Ontario website. This clearly indicates the club/school has met the CanSkate programming standards. Prospective skaters and parents will be able to easily identify clubs who have proven standard for the learn-to-skate program. Clubs/Schools who complete the CanSkate Excellence application and review process at advanced CanSkate standard will be highlighted with a ⭐ on the website. Starred clubs/schools will have priority listing on the website. These clubs/schools will also be listed in priority in a club/school search for prospective skaters/parents. In an effort to highlight the exceptional programs in the province, we will also be highlighting advanced CanSkate standard clubs/schools by featuring them on our social media. The feature could be in the form of a picture, story or shout-out on one or more of our social media platforms. Please note: As part of the CanSkate Excellence program, Skate Ontario will be conducting random visits to affirm standards are being met. If you have any questions about the program or the application process, please contact Sharon Maki at smaki@skateontario.org.